Robert and Carolyn Francis invite you to be a part of our Senior Citizens travel group. 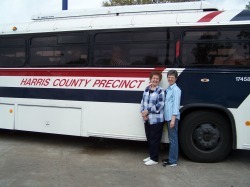 We are so lucky that Harris County Precinct2gether has a fleet of modern buses that allow us to go places. There are so many things to see and do in the Houston area and surrounding counties. Many folks are totally unaware of unusual places of interest in our own backyard and are surprised at the unique trips that we take. Did you know that there is a castle in Bellville, TX? (See the picture above.) We go to baseball games, plays and musicals. Our group has chased ghosts in Houston and Galveston, ridden horses at Cat Spring , toured the George H. V. Bush Presidential Library in College Station, and seen Old Sparky at the Prison Museum in Huntsville. We have a lot of fun! Also, discount tickets to Imax Theaters are provided by Precinct2gether. Take a look at the photo galleries (top of this page) to see pictures of some of the places we have gone over the years. Upcoming trips are also posted for your convenience. Just click on Upcoming Trips at the top of the page. To travel with us you only have to be 50 years of age or older or have a spouse who is at least 50 to qualify. The buses are air conditioned and comfortable, and the drivers are well-trained, friendly, and helpful. Robert schedules trips on behalf of the Baytown Area Retired School Employees Association (http://www.http://localunits.org/Baytown) and Carolyn for our church, St. John's United Methodist Church (http://www.stjohnsumcbaytown.org/index.html). So, don't just sit there; get up off that couch, and let's go!